Since 2003, Kevin Hall, PhD–a physicist turned metabolism researcher at the National Institute of Diabetes and Digestive and Kidney Diseases–has been using data from dozens of controlled feeding studies conducted over decades of nutrition research to build mathematical models of how different nutrients affect human metabolism and body weight. 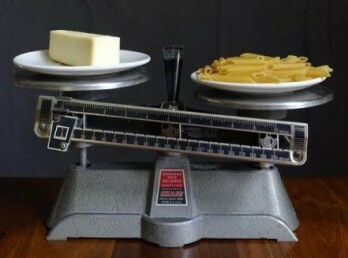 He noticed that despite claims about carbohydrate versus fat restriction for weight loss, nobody had ever measured what would happen if carbs were selectively cut from the diet while fat remained at a baseline or vice versa. His model simulations showed that only the carb-restricted diet would lead to changes in the amount of fat burned by the body, whereas the reduced-fat diet would lead to greater overall body fat loss, but he needed the human data to back it up. Studying the effects of diet on weight loss is often confounded by the difficulty in measuring what people actually eat–participants may not adhere to meal plans, misjudge amounts, or are not truthful in follow-up surveys. To counter this, Hall and colleagues confined 19 consenting adults with obesity to a metabolic ward for a pair of 2-week periods, over the course of which every morsel of food eaten was closely monitored and controlled. To keep the variables simple, the two observation periods were like two sides of a balance scale: during the first period, 30% of baseline calories were cut through carb restriction alone, while fat intake remained the same. During the second period the conditions were reversed. Each day, the researchers measured how much fat each participant ate and burned and used this information to calculate the rate of body fat loss. At the end of the two dieting periods, the mathematical model proved to be correct. Body fat lost with dietary fat restriction was greater compared with carbohydrate restriction, even though more fat was burned with the low-carb diet. However, over prolonged periods the model predicted that the body acts to minimize body fat differences between diets that are equal in calories but varying widely in their ratio of carbohydrate to fat. Hall does caution against making sweeping conclusions about how to diet from this study. The study’s purpose was to explore the physiology of how equal calorie reductions of fat versus carbs affect the human body. The research is limited by its sample size; only 19 people could be enrolled due to the expense of such research and the restrictiveness of the carefully controlled protocol. However, this study clearly reaches statistical significance. In addition,, the menu that the participants followed does not emulate normal dieting and does not account for what diet would be easier to eat over extended periods. Hall recommends that for now, the best diet is the one that you can stick to. His lab will next investigate how reduced-carbohydrate and reduced-fat diets affect the brain’s reward circuitry, as well as its response to food stimuli. He hopes these results might inform why people respond differently to different diets.